I have flown longhaul twice now. Once to Tanzania, for our Honeymoon, and now to Singapore. The flight to Africa I remember fondly. We managed to persuade an exceptionally bad tempered air steward to grab us two glasses of champagne from Business Class by screaming ‘WE’RE ON OUR HONEYMOON!’ at him each time he marched past us until he relaxed his ‘I have no alcohol with bubbles’ line and flung our bubbly at us with supreme bad grace, probably hoping it would sedate us for the flight. The flights to and from Singapore were less comfortable. Longhaul is HARD WORK, regardless of whether you are flying with a child or not. Blake, despite all my worrying, was a dream on both flights thanks in no small part to BA’s decision to screen Planes – Fire and Rescue on the in flight entertainment. James and I did not fare so well. There is not a lot of legroom when you are in cattle class is there? This stings in particular when the f**kers make you board at the front of the plane and parade you past the (smug) Business-classers (OH LOOK EVERYONE, HERE COME THE PLEBS! MIND YOU TUCK YOUR FEET INTO THE MILE LONG SPACE YOU HAVE IN FRONT OF YOU TO AVOID TRIPPING THEM UP AS THEY STAGGER PAST TO THEIR MATCHBOXES. I AM NOT BITTER.) James and I are both of the leggy variety, and I have totally ruined my knees pretending to be a runner of late, so the limited space left him bruised by virtue of having to sit with the seat frame in front pressing directly into his knee and left me administering baby Nurofen through a medicine syringe at 2am to try and take the edge off the severe cramp that had set in. And then there is always the possibility that they will seat you next to someone INSANE. An insane woman perhaps, who insists on chatting loudly on her mobile phone until the plane has finished taxiing and is about to take off and said phone is forcibly removed from her hands by the world’s most intimidating air stewardess, who seems to take her proximity to you as a sign that you are all related and should be treated with total disdain. Meanwhile, the loon has blown up a travel pillow and placed this around the front of her throat so that it serves as essentially an inflatable neck brace and dropped immediately into the kind of deep sleep that necessitates snoring like a warthog. Periodically she will fling out her right arm out and punch you in the side of the head/shoulder. And then, after HOURS AND HOURS OF HER BLOODY SNORING she will rouse herself (and the rest of Economy) gently from her slumber with the kind of rattling, roaring intake of breath you’d expect from an Elephant, peer indignantly at you and your sleeping child, hook her toes into the arm well of the seats in front (forcing you to sit at a jaunty diagonal angle), cover her head with her blanket and resume snoring. Thirteen and a half hours is a long time. Initially, in the early stages, you kid yourself into thinking it is speeding by. ‘Oooooh, down to 10 hours 43 minutes already’ I thought to myself. That’s gone pretty fast! 3 hours in already! And then comes the crushing realisation that your child is asleep on your lap, preventing you from any movement beyond breathing, and you have OVER TEN HOURS left to go. You watch the minutes tick. down. slowly. and the passing of each hour is met with a small sense of triumph and then horror that you ARE NOT EVEN HALF WAY THERE. And finally, with a couple of hours to go, your child wakes and you think you’ll treat yourself to a little trip to the toilet to wash your face and brush your teeth given your mouth feels like a badger has died in it, and you trot merrily into the bathroom in which someone has just had a little puke. And this sentences you to sitting, nauseous, for the remaining long hours of the flight, fighting the urge to have a little vomit of your own whilst your stomach churns like a washing machine. I sound ungrateful don’t I? Ultimately I’d do it all again in a heart beat for the holiday we’ve just had, but that doesn’t stop it being a flipping uncomfortable way to spend near on 27 hours. Anyway – if you are flying longhaul (or any haul) with a child, here’s what worked for us. 1. Prep them for it. Continually and relentlessly. This us my number 1 tip. We booked our flights about 2 months in advance and from the minute we knew the trip was going ahead we talked to Blake about the fact he would be going on an airplane and flying through the night, and that he would have his sleep on the airplane. That didn’t stop some open hostility to the idea of the journey (at one point he was quite convinced he was walking to Singapore), but it also meant the experience didn’t take him completely by surprise and throw him off course. 2. Take your child’s pillow and a pair of pyjamas. The familiarity seemed to work well to reassure Blake, and the PJs were incredibly useful when a helpful waiter at Heathrow knocked a pint of Coke over him. 3. Buy toddler head-phones and resign yourself to the fact that you are going to have to lay any concerns about excessive TV consumption to one side for now. And then thank your lucky stars that the airline have put two movies your child will watch onto the in-flight entertainment and allow him/her to watch them on repeat until you land if necessary. 4. Make sure you’ve confirmed your meals in advance. We did not do this, meaning that Blake was served up an adult meal on the way out and subsequently didn’t eat. Eating is good – you’re working towards a food coma here, and it also passes time. 5. Airlines have a ‘secret’ stash of snacks available for young flyers. Raid it mercilessly at 4am when delirium has set in for you and your child is hungry. 6. Lower your expectations. It is not going to be stress free or straightforward. Your child probably will cry somewhere along the line. But it is, in the scheme of things, a tiny proportion of your life. Other passengers are not as bothered by your child’s cry as you are, and a refreshing number of them actually want to help. Grit your teeth, take advantage of the free bar to take the edge off your nerves (don’t get pissed though – even I can see that’s a bad plan), and roll with it. It will be over soon enough. 7. Take children’s medicine on board. You can all take it if it comes to it. 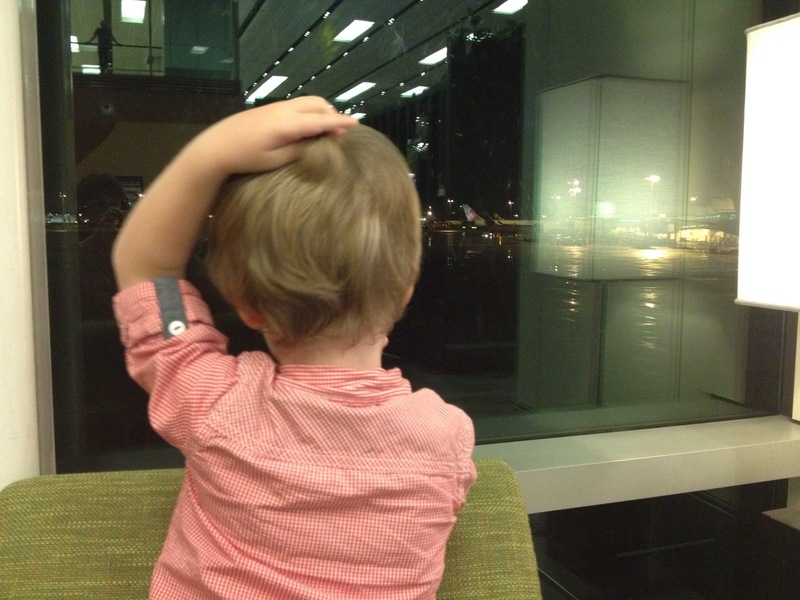 Here’s Blake watching the planes at Singapore before we boarded.